Gaetano Donizetti; Gioachino Rossini; Vincenzo Bellini. Very Good. In very good packaging. 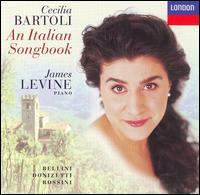 James Levine-Cecilia Bartoli-An Italian Songbook by James Levine. Good. 028945551326 fast shipping excellent service previous library material only a couple light scratches. Fine. 028945551326 Perfect except not sealed. Ask about discounted shipping available when multiple items are purchased at the same time FAST, RELIABLE, GUARANTEED and happily SHIPPED WITHIN 1 BUSINESS DAY! Very Good. Great shape. Audio CD Used-Very Good 1997mment. Fine. 028945551326 This item is guaranteed to play perfectly with all original artwork and materials. U.